Developed by Ubisoft Montreal. Published by Ubisoft. Released May 27, 2014. Available on PC, PS3, PS4 (reviewed), Xbox 360, Xbox One. Watch Dogs is seen by some as the true herald of a new generation of videogames, a view that Ubisoft itself has done little to discourage. An open world game sold on impressive visual quality and the unique promise of "hacking the world," this story of cyber crime and info brokering is not quite the revolution it may first appear to be. It is, however, a slickly produced, highly polished example of sandbox gaming with an embarrassment of riches in the content department. You are Aiden Pearce, a shady hacker with an allegedly Iconic Baseball Cap and a magic cellphone that can interact with the online mainframe running almost every scrap of tech in Chicago - ctOS. After an infiltration job goes horribly wrong, Pearce finds himself on the wrong side of some very dangerous men, getting his family caught in the crossfire. Exploiting ctOS to his own ends, Pearce turns vigilante, dishing out justice to evildoers in his own violent manner, and placing himself in the sights of some very scary men indeed. It's the done thing. While the story plays out quite a few overused tropes, there's something of the 1990s movie scene - where the "information superhighway" was once thought capable of literally anything - about the conspiratorial narrative. The story is told with an impressively stylish presentation, and it's hard not to get personally invested in Aiden's adventure. It says a lot about a game when one is into its plot enough to feel a need to see the villains taken down, but Watch Dogs' cast of bad guys is vile enough to invoke such a feeling. I wish Aiden himself had a bit more personality outside of "gruff wronged man," but sadly we have an industry-wide epidemic of that stock character. It has to be said - a baseball cap is not iconic if yet another growling photogenic white guy is underneath it. You can't just baseball cap your way into the history books, Ubisoft! In any case, the campaign - which comprises five lengthy chapters - starts small and grows into something intriguing, paced out perfectly and helped by a fantastic soundtrack to sell the game's most evocative moments. At times the story swims in banal waters - a particular kidnap plot reeks of played out writing - but individual plot points are very well told indeed. The missions involving rival hacker Defalt are a particular highlight, and the "big reveal" toward the end is sublime as it highlights the pettiness of Chicago's evildoers. For the most part, Watch Dogs is almost surprisingly mundane in its approach to open world adventuring - in fact, it suffers somewhat from the near-total homogenization and uniformity Ubisoft encourages in all of its games. As players travel Chicago and unlock new things to do, the game can be seen as something of a Frankenstein's Monster of previous Ubisoft titles. Whether you're parkouring around the city a'la Assassin's Creed, cracking data towers to open up the map like FarCry 3, or enjoying the kind of gadget-based stealthing Sam Fisher employs in Splinter Cell, this hyped herald of a new generation feels distinctly like a case of "been there, done that." This is not to say that what Watch Dogs does is particularly bad - in fact, Ubisoft Montreal has quite comprehensively cultivated some of the best examples of open world gameplay and pulled it off quite well. The main missions are fun, the optional quests are highly addictive, and everything has a level of solidity and competence that surpasses many other big budget titles. It should be noted, however, that if one goes into Watch Dogs expecting a breath of fresh air, one is in for a disappointment. Despite its hacking gimmick, Watch Dogs' content is mostly notably "normal." The central hacking gimmick is pretty fun, though. Using his ever-present cellphone, Aiden can manipulate the world around him, interacting with technology to suit his needs. While in "Profile" mode, players can pry into the lives of everybody around them, with names and personal secrets appearing onscreen at all times. Some NPC phones can also be hacked, allowing one to listen in on conversations, gather information on crimes in progress, or steal software keys and cash from bank accounts. There's something fun about simply wandering the streets, seeing who isn't allowed near schools or who ran with the bulls in Spain. While the data is prone to repeat with enough playtime, there's enough variety to where it won't repeat very often, even after hours upon hours of play. The amount of phone call audio and text message logs that one can uncover, stuff that really means nothing to the game itself, is staggering, and all contributes to the creation of a believable world. As well as spying and stealing, Aiden's phone can be used to remotely control devices, be they computers, traffic lights, road barriers, or even helicopters. Players can also craft gadgets that screw up enemy comms systems or create a block-wide blackout that allows for effective night-time stealth. All this is done with the simple press of a button in the right context (Ubisoft's love of simplicity is in full effect! ), and while one may sometimes accidentally set off a nearby explosive when trying to merely hack a surveillance camera, the hacking system is mostly elegant, allowing for fast and efficient control over the world. With prompted commands, one can create traffic chaos, burst sewer pipes, and raise spikes in the road when pursuing, or being pursued by, enemy vehicles. One can craft and hack devices that make noise, luring enemies into the right spot for a quick takedown. 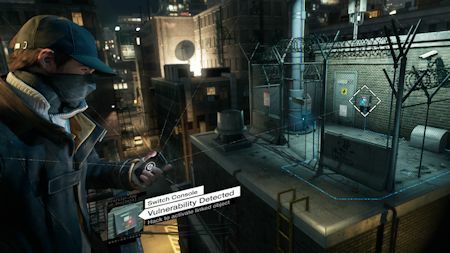 By hacking cameras, then using his new vantage point to hack more cameras, Aiden can get a full view of an area before infiltrating, tagging opponents or exploding grenades and circuit boxes to level the playing field without getting his hands dirty. While the controls are quite basic and a bit more limited than one might hope (exploding things only gets so varied), a significant sense of empowerment is hard to argue with, and the interface is so fluid that even a simpleton can feel like a master hacker. It feels cool, that's for damn sure.